Valor fans come unglued in the background after receiver T.T. Tolliver ran in a 3-yard score to put Washington up 34-6 in the second quarter during last Friday's AFL game at Verizon Center. Photo by Austin McFadden. 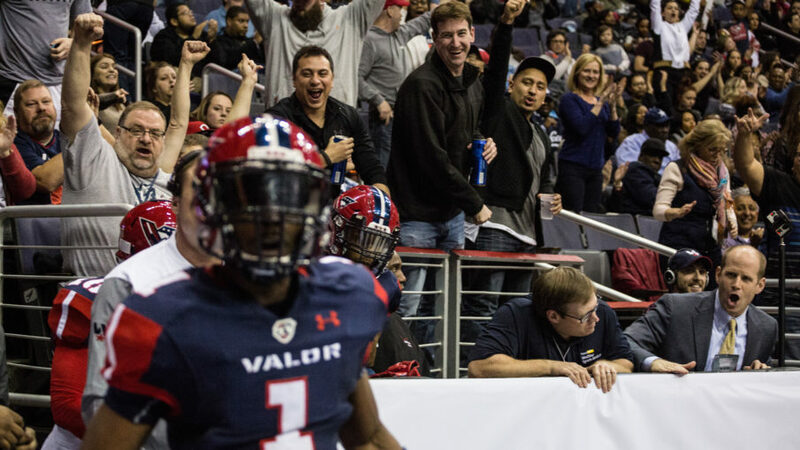 In case you haven’t heard, the Washington Valor — D.C.’s fledgling Arena Football League franchise — made its debut on Friday night at the Verizon Center, and dubbing it as a success would put it mildly. It was an auspicious spectacle, the equivalent to a walkoff home run, because if it hadn’t delivered in the clutch, the year-long anticipation would fizzle and likely send it to the grave. The AFL had slumped to three teams after five franchises folded a summer ago. Then D.C. philanthropist Ted Leonsis — also majority owner of the NBA’s Washington Wizards, NHL’s Washington Capitals and WNBA’s Washington Mystics — swooped in and took the league off life support, launching two new teams in D.C. and Baltimore. 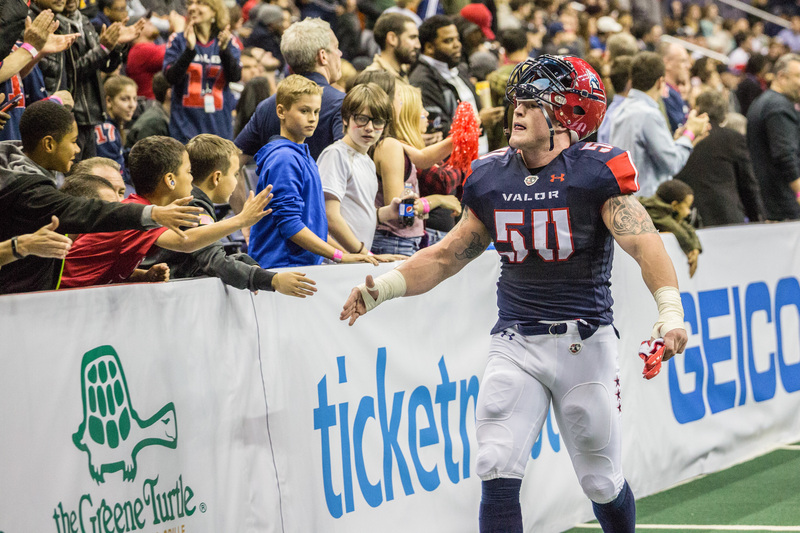 The two squared off on Friday night, drawing nearly 16,000 fans, chanting, yelling, rooting, pumping their fists into the arena buzz during Valor’s 51-38 win. Harrison Brown, who’s covered the AFL since 2012, said it was the largest crowd he’s ever seen for a league game. The exact turnout was 15,579, not far off the average attendance for other D.C. sports franchises who play at the Verizon Center (seats about 19,500). The Capitals and Wizards, both playoff teams in their respective leagues, average 18,506 and 17,002 fans for the 2016-17 season. The Mystics only draw 7,710 per night. 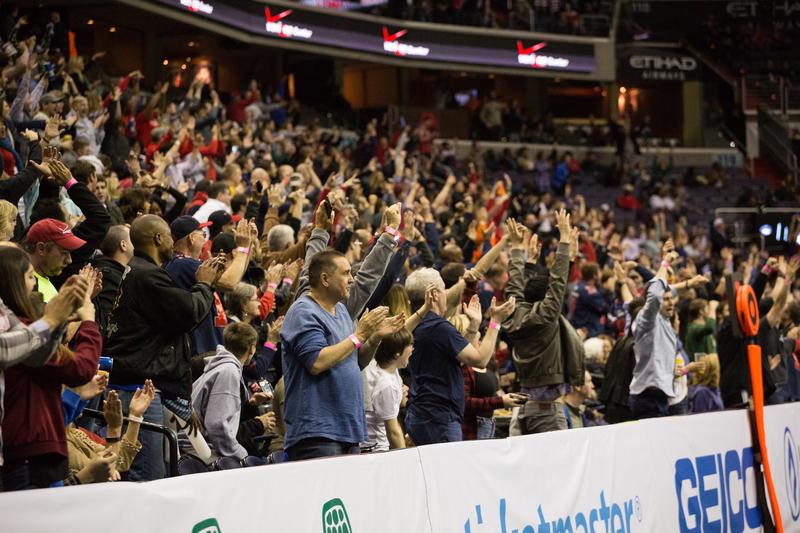 In its debut, the Washington Valor garnered 15,579 fans at the Verizon Center last Friday night. Photo by Austin McFadden. Some patrons doned Capitals, Redskins and/or Wizards gear. Others rolled with a shade of red, white and/or blue. Valor apparel came about sparingly. Season-ticket holders received special Valor jerseys, which read “Founding Fan” on the back. In order for D.C.’s newest sports franchise to thrive and not fold up shop like five of the league’s eight teams a year ago, it’s going to need adequate support. Kent Zakour, a born-and-raised D.C. sports fan and previous season-ticket holder for the Capitals, Redskins and Wizards, instantly jumped on the Valor bandwagon, purchasing season tickets for the 2017 season as soon as the franchise announced its arrival last summer. That’s one of many unique opportunities the AFL offers: Allowing fans to keep footballs that enter the stands. And even though the rules are slightly different than traditional American football, at the end of the day, it’s still football: Athletes grinding at the line of scrimmage, gun-slinging quarterbacks, swift receivers, bone-crunching hits, a pigskin football. Some things will take time to get used to, like the 50-yard field (NFL and college play with a 100-yard field) and eight players instead of 11. It’s still four plays, 10 yards for a first down, and 15-minute quarters. For time’s sake, there’s a running clock and few stoppages. The pace is riveting. 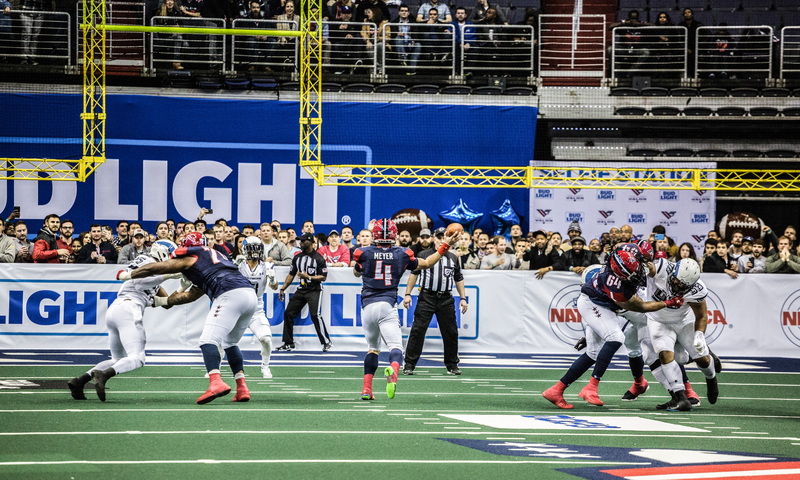 Valor quarterback Erik Meyer threads a pass through the Brigade defense in last Friday’s AFL contest at the Verizon Center. Photo by Austin McFadden. If I had a kid, I would take him/her to a Valor game, AFL game in general, any day of the week. 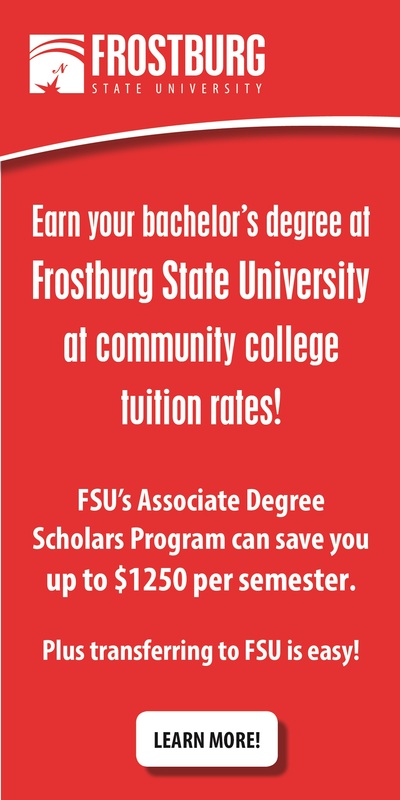 First of all, it’s cheap for a professional sporting event. Tickets start as low as $15. You can probably get a set of tickets for free by working connections. Second, you get the same adrenaline buzz in the stands as you would at a Capitals game, considered as one of the most electrifying atmospheres in sports. Third, chances are the crowds aren’t as large. Getting in and out of the stadium will be less of a hassle, and that in itself makes the experience enjoyable. And lastly, the AFL opens their field at the end of games for fans to survey, with players available to sign autographs and take pictures with. Before Mike Washington moseyed back to the dressing room on Friday night, and before we started our interview, two kids — brothers if you took a guess — tugged at his jersey, requesting for a photo and a signature on their pieces of memorabilia. Washington obliged, and the kids left the arena as giddy as anyone as I’ve seen in awhile. For most people, minor league baseball games is the appropriate route for getting youth accustomed to sporting events. Seldom do you come across a kid experiencing his first live sporting event at an NBA, NFL or NHL game. Because of the market, the AFL will likely not surpass minor league baseball for that position. But that doesn’t mean it can’t sit atop the list in some households. Pay a little more, cope with the outrageous concessions prices, and you get to experience live, professional football in the midst of baseball season. Valor defensive lineman James Gordon acknowledges young fans during their debut last Friday at the Verizon Center. Photo by Austin McFadden. To counter an excuse for not going to a game, people could say, well, there’s no one player or two I can grow fond of and dub as a fan favorite. Sure, there isn’t a Josh Norman, Ryan Kerrigan, Kirk Cousins, or Odell Beckham, someone even close to the same level of marketability. But there are plenty of names you can fasten to. Defensive back Tracy Belton, quarterback Erik Meyer and receiver T.T. Tolliver come to mind. Belton, who graduated from Largo High School in Prince George’s County, is the league’s reigning defensive Player of the Year. Meyer won the league’s Most Valuable Player in 2013 and Tolliver is the league’s all-time leader in receiving yards at age 40. But even if the 15,000-plus fans who packed the Verizon Center on Friday night had not a clue under the sun who any player was, they were fueled solely by the D.C. sports crave. 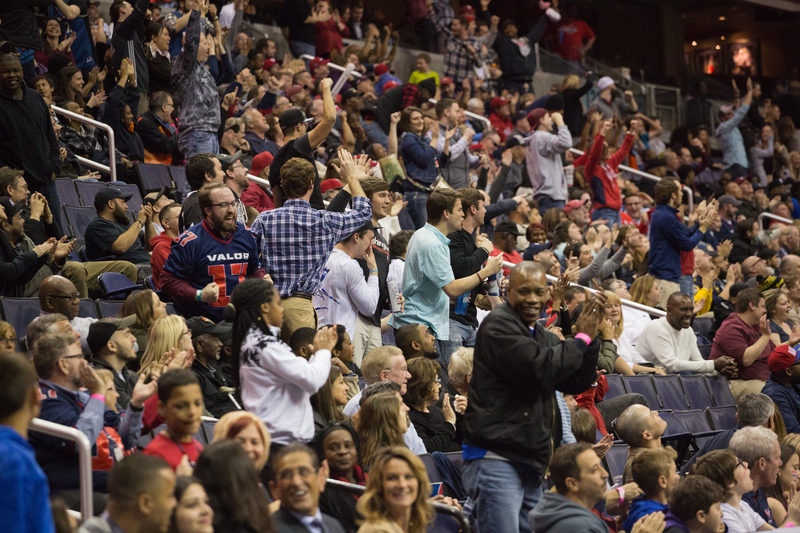 “We were pleasantly surprised with how everyone was into [the game],” said Kent Zakour, a lifelong D.C. sports fan. Photo by Austin McFadden. Players like Washington, who aren’t accustomed to a D.C. sports atmosphere, was astonished. Even Belton, who grew up on D.C. sports 10 minutes from the Verizon Center, was blown away. The same goes with Zakour, the lifelong D.C. sports fanatic. That’s the next unknown: Will the buzz carry forward, or will the novelty fizzle? There’s only one way to find out. Just give an AFL game, a Valor game, a shot.